= Wind Turbine Syndrome (WTS) is the clinical term for the collection of symptoms such as sleep disorders, headaches, tinnitus, nausea, irritability, loss of memory and concentration, nervousness, rapid heart rate, blood pressure, weight changes, abnormal heartbeat rhythms, mood problems, fatigue and depression experienced by many people living close to industrial wind turbine. 풍력발전기 증후군은 풍력발전기 주변에 사는 많은 사람들이 경험하는 수면장애, 두통, 귀울림, 구토, 과민증세, 기억상실, 집중력 상실, 신경과민, 심장박동과 혈압 증가, 체중변화, 심장박동 이상, 기분장애(기분이 나빠짐), 피로감과 우울증세 등과 같은 일련의 증상들을 일컫는 임상학적 용어이다. = any of various types of machine in which the kinetic energy of a moving fluid is converted into mechanical energy by causing a bladed rotor to rotate. The moving fluid may be water, steam, air, or combustion products of a fuel. 날개가 달린 회전자를 회전시킴으로써 유체의 운동에너지를 기계에너지로 바꾸어 주는 다양한 형태의 기계나 기구를 말하며, 유체로는 물, 김, 공기, 연소물질 등이 있다. 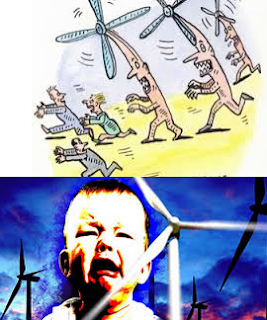 ● Wind turbines making people sick with mysterious illnesses. Wind turbines create low frequencies that can cause health problems, admit experts. ● A recent investigation by ABC News into so-called "wind turbine syndrome," or the collection of illness symptoms commonly reported by people who live near wind turbines, has uncovered a string of related ailments associated with the use of this technology, especially near residential areas.